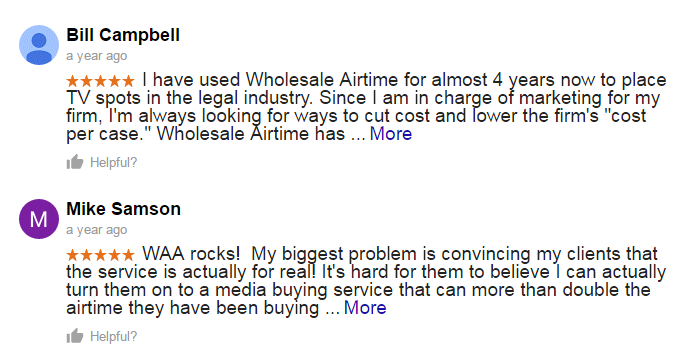 Welcome to Wholesale Airtime Auction! 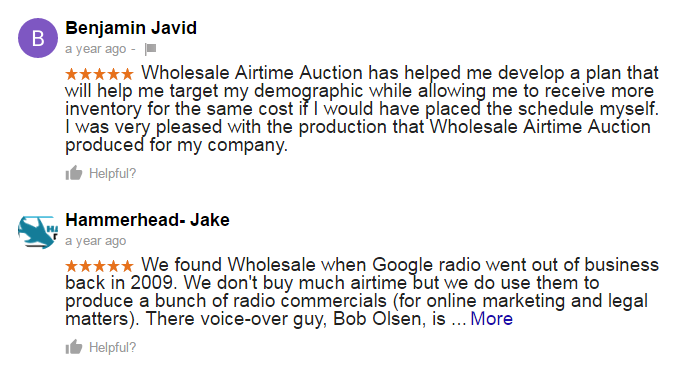 You may ask, “How can Wholesale Airtime Auction deliver bulk advertising packages for 3 to 50 cents on the dollar?” In order to answer that question, we need to give you a little historical background. TV stations and radio stations have what is called “perishable inventory.” Perishable inventory is not exclusive to radio and TV airtime; it affects other types of businesses as well: tomato and lettuce farmers, hotels, and even airlines. Radio and TV stations have a set amount of slots (i.e. 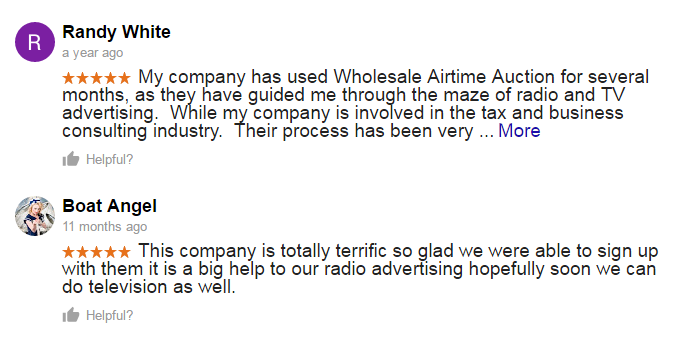 radio commercials and TV commercials) to sell every day. If they do not sell a slot, then the potential revenue perishes. The slot itself does not perish (like a tomato), but the revenue does. If they end up having to bonus (give away for free) the commercial slot to one of their existing customers, then they have lost that revenue forever. Twenty years ago, most stations had very little unsold inventory. That all changed, though, when the Internet era began in 1994. Since that time, many radio stations, TV stations have watched their revenue gradually shrink, while watching unsold inventory levels grow. Yes, the migration of existing advertising dollars to the Internet has slowed, and even flattened out completely in some areas of the U.S.; however, the pie has been permanently split, and the bell cannot be un-rung. Our TV and radio media buyers auction takes advantage of this long-term change in the industry. The auction is held weekly, and starts every Monday. The fire-sale auction process allows our customers to submit CPM-based offers (if you don’t know what CPM is, click here to learn) simultaneously, to multiple stations. When the stations receive the offers for their inventory, they know that there are several other stations that have received them as well. The stations are then encouraged to accept the fire-sale offers before other stations in the market accept them and your budget becomes exhausted in turn. As soon as your budget for the time period (2 weeks, 4 weeks, 6 weeks, etc.) is exhausted, the fire-sale auction closes. So not only does our fire-sale auction process take advantage of perishable inventory situations, it also creates urgency and competition between stations, and allows us to dictate the CPM price we are willing to pay. #3 Choose from four different time-blocks on the weekdays and weekends: daytime, prime time, evenings, or overnight. To listen to radio commercials we have aired, click here: aired radio commercials. To view TV commercials we have aired, click here: client aired TV commercials. To read comments from some of our advertisings about our weekly fire-sale auction, please click here: Review Wholesale Airtime Auction & Letters of Reference. 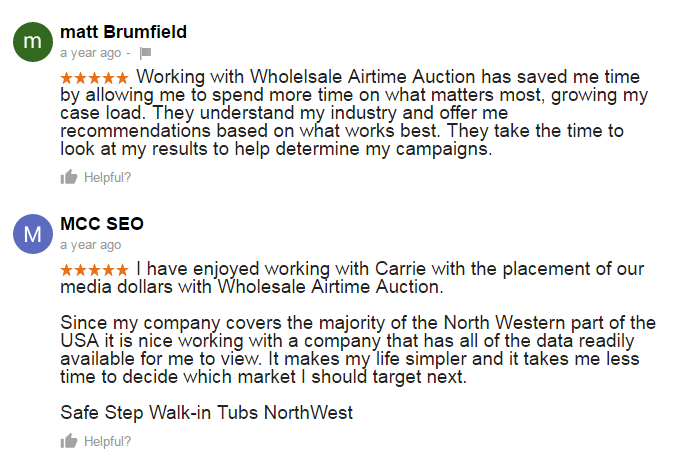 If you would like to see a video demo, or a weekly “toy” wholesale auction sheet, you will need to contact us directly. 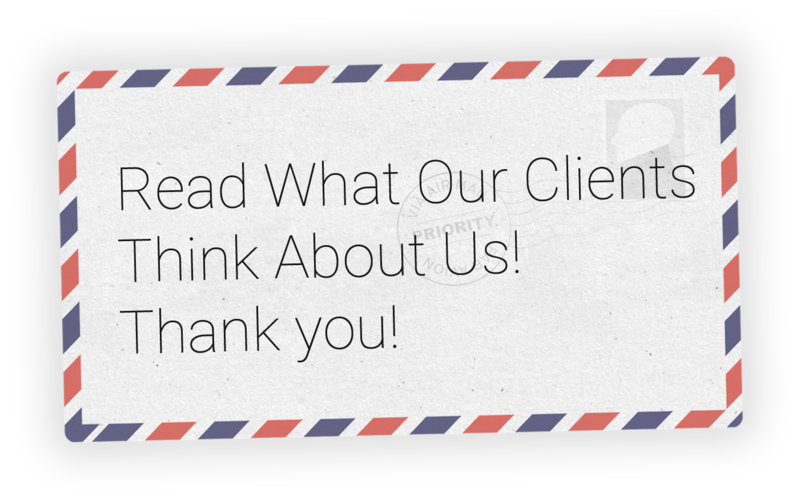 You may click here (Contact Us) to submit a web form, or call 302-724-6592.